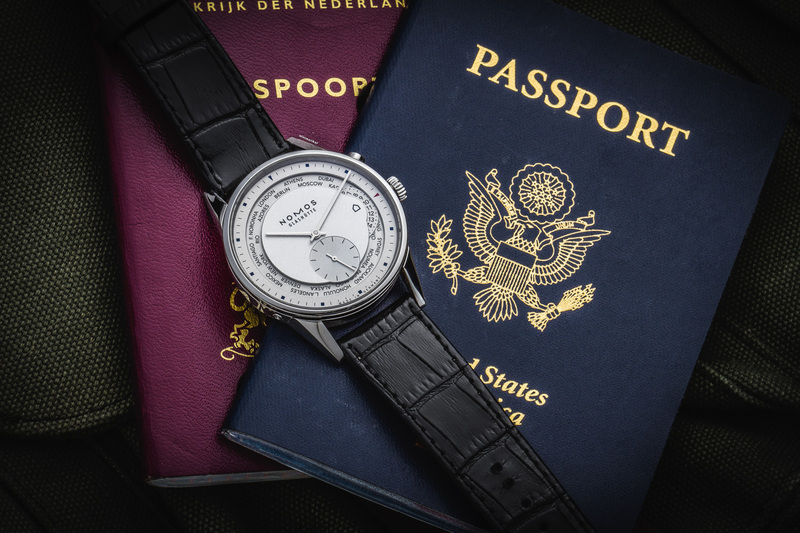 editorial: it’s not a worldtimer! 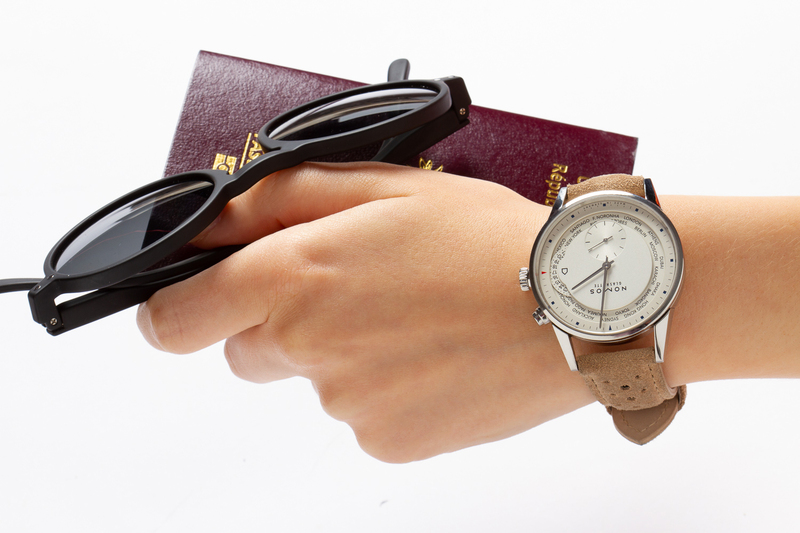 NOMOS refers to the travel-savvy version of the Zürich as weltzeit, or world time in English. It is however often said that the Zürich Weltzeit is not a true world timer. Is this true, and does it matter? What is a world timer? They show all 24 world time zones at a glance. The local time is most prominently displayed for the time zone whose assigned city name is just above the small red arrow at 12 o’clock – in the classic manner with the hour and minute hands. In the other 23 zones, the times are directly readable on the 24-hour ring that rotates counterclockwise within the city disk. The minutes indicated by the minute hand are the same for all time zones. When traveling into a different time zone, the pusher in the case at 10 o’clock is pressed as often as needed to align the respective city name with the red arrow at 12 o’clock. Each time the pusher is pressed, the hour hand will advance by one hour while the city disk and the 24-hour ring will move by one increment in the counterclockwise direction. The key takeaway is that time is read in multiple, clearly labeled time zones simultaneously. I don’t think that there are any hard and fast rules regarding how many, but preferably 24 or more – there are some 38 in use today. With Patek it is the 24-hour ring that rotates, while with others (such as the Tissot below) it is the city disc that does. Is the Zurich Weltzeit a world timer? So, the Zürich Weltzeit… This watch was introduced back in 2011. Still today it is one of NOMOS’ most eleborate watches, both in terms of movement as well as case construction. As far as stainless steel NOMOS watches go, it is top of the line. But is it a world timer? It has Weltzeit in its name, so the answer must be pretty straight forward right? Eh, no. While the Zürich Weltzeit is one of my favorite watches, it is not a world time watch in the strict sense of the word. The city disc is there to indicate which time is shown by the central hour and minute hands. The 24-hour disc at 3:00 shows home time, as indicated by the 🏠. The button at 2:00 let’s you select a different city; when pressing it the disc will jump to the next city, and the hands will show the time accordingly. In the mean time the 3:00 disc will remain stationary, displaying the time back home. Jumping between the 24 different cities is a breeze., and the oft-flawed legibility of traditional watches with world time functions is 100% on point. As per the best NOMOS tradition! September 13th the Arab Watch Club unveiled their special edition NOMOS Zürich Weltzeit on ArabWatchGuide.com. The NOMOS Zürich, either with or without date, was introduced in 2009. The Weltzeit was added to the collection two years later. It is the most complicated NOMOS to date, though it does not feature a Weltzeit (Worldtime) indication as suggested by its name; rather it allows two time zones to be shown simultaneously. First is your home time, which is indicated on a 24-hour disc at 3:00. Then there’s the time of the timezone in which you’re currently residing, which is indicated through the main hands in combination with the 24-city disc. Traveling to another time zone? A push of the button at 2:00 will have both the city disc and the hour hand jumping forward in 1-hour increments. This is all courtesy of an in-house, self-winding movement that started its life as caliber Xi, and became DUW 5201 with the addition of NOMOS proprietary ‘Swing System’ escapement around 2014. The case of the Zürich Weltzeit measures just a tad under 40mm and consists of no less than ten parts – excluding the six screws that hold the see-through case back. It’s rated water resistant up to 30 meters and takes 20mm straps. Back when the Zürich was introduced NOMOS called it its first luxury watch. While they might be overstating things just a little bit, the Zürich does feel more deluxe than most of its siblings. 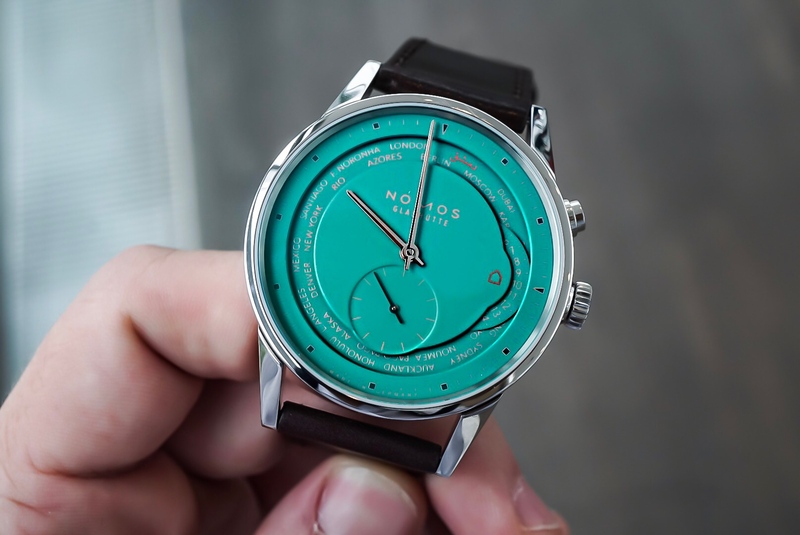 It’s still 100% NOMOS, but it’s different – as if the brand managed to shed some of those Deutsche Werkbund ethics in favor of a slightly more Swiss approach. This shows first and foremost in the case, which is more elaborate than those of other models. As touched upon in the above it consists of no less than ten separate parts – easily double that of your average NOMOS. Four of these are the lugs, which are all separate parts, attached to the case through screws from the inside. Viewed from the side they feature an ever-so subtle inward curve, and they’re raised as to create a slot in which the bezel rests – pictured below on Zurich Date model. The dial is another work of art. It consists of four distinct parts over three levels, adding a lot of visual depth and interested. Viewed from a slight angle it’s almost like a cityscape of a futuristic urban hub – which is very apt considering the traveling nature this watch. The frosty silvered finish is broken by the crisp black print, subtle dashes of blue and red on the hours, and the concentric circles of the small seconds scale. Center stage is reserved for the local time, which is indicated through a set of faceted hands of the perfect length. On my wrist, the Zürich wears well. It’s larger than my Club in diameter, but lug-to-lug the difference is almost negligible. It furthermore looks good on a host of straps. Aside from the standard issue Shell Cordovan I tried it on a faux alligator strap and a rubber strap. The latter should’t work on a reasonably chic & dressy watch like this, but (to me) even this looked good. The clean & simple design of many NOMOS’ seems to work with just about anything and the Zürich is no exception. It’s save to say that I thoroughly enjoyed my time spent with it, especially since it’s so different from my simple Club. A review of the Zurich Weltzeit is could never be complete without describing the utter joy of pressing the 2:00 button. The push action is perfect; requiring just the right amount of force. It results in a very reassuring clicking sound and the jump of the hour hand and city disc. It’s simply addictive, though I suppose one shouldn’t go about pressing it constantly throughout the day. The Zürich distinctively NOMOS, yet at the same time it’s different enough to convince even the most Swiss-centric among collectors. It’s not as clean & minimalist as others in the collection, yet it is easily recognizable as a NOMOS. It has a beautiful case in a sensible size. The dial offers a lot of information but never feels overly cluttered. The movement is in-house and fitted with a great and handy complication. And it’s priced per NOMOS standards: very competitively. Besides watches & jewelry, BaselWorld is famous for the ‘swag’ given out by brands to jewelers, press, clients and distributors. 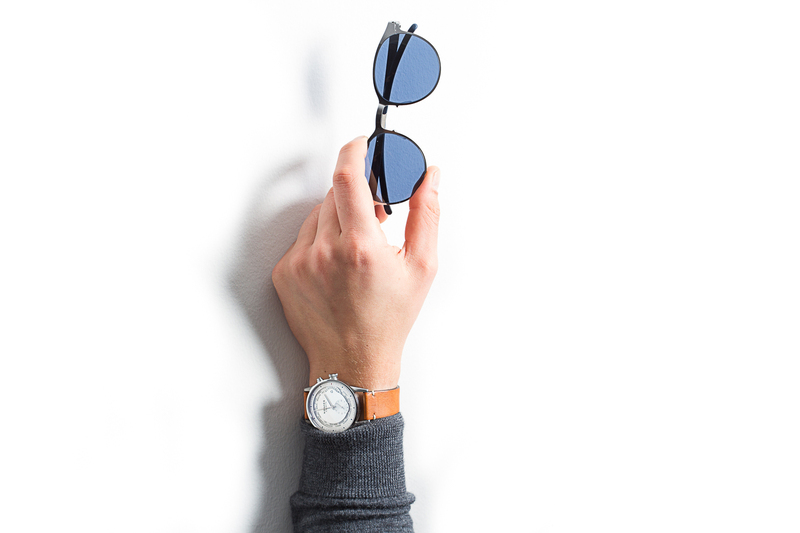 At BaselWorld 2017 NOMOS took home the prize for best swag with these limited edition MYKITA sunglasses.